With all the exciting news about vSphere 5.0 and the Windows 8 beta being released over the past couple of week’s one product announcement may have gone unnoticed. 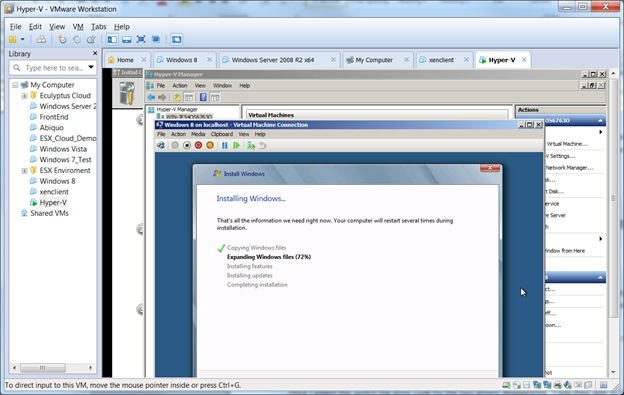 VMware Workstation 8 was released. 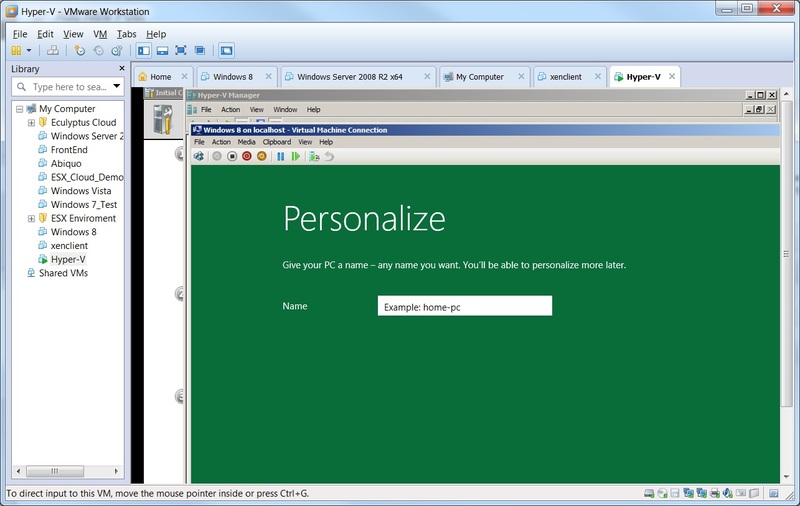 For us virtualization geeks this is a big deal. Of all the advice on the page the one thing that made the two drivers work were adding the following line to the configuration file for the Hyper-V VM. Once I added this switch the error code for the two drivers disappeared. I was then able to boot my nested virtual machine. I actually got extremely ambitious and decided to install 64-bit Windows 8 as the nested VM. ← What Makes a Virtualized Environment a Cloud? But I would like to ask you about your processor. As far as I know this configuration is possible only with INTEL i7 processors. Krasimir, the E86000 doesn’t support this configuration. You don’t need an i7 but you do need a processor that support either Intel VT-x/EPT or AMD-V/RVI. The i5 also support VT-X/EPT. I’m not sure about the i3’s. I am running dual E5420s in a dell, enabled the VT in bios and am still getting an error in Workstation when I try to start a W8 or Serve 2012….any help? And you’re running 64-Bit OS? What error are you getting? So, you are getting the error in after the first screen shot of this post? I just checked Intel’s website and I’m assuming you mean the Xeon E5420 which should support VT-x. 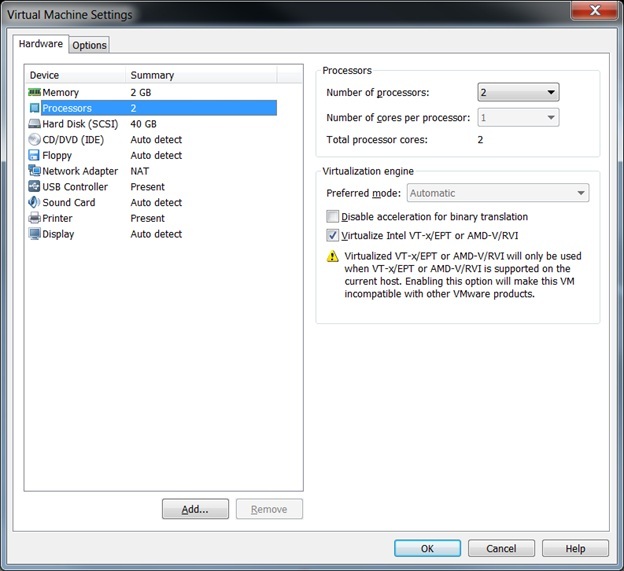 You should also be running Workstation 8 version of the VM. Yes, Workstation 8 runing on Win7 Pro on a dell with dual E5420s. I just downloaded Win8 ISO and tried to creat a new VM. Before it even powers on, I get the VT-x error. Just to validate VM WS8 is working well, I created a new Win7 x64 VM with no problems. It would appear you have solved the problem I’m struggling with. Apparently you have a driver for Windows 8 to access the Network Adapter. Where did you find it? I don’t recall needing to install a driver for the Hyper-V machine.